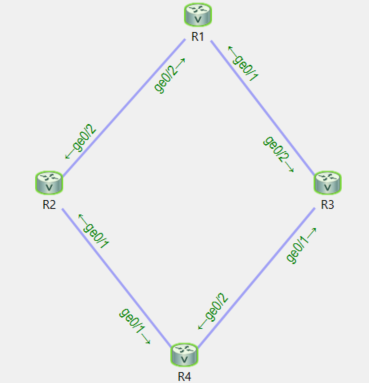 Today I’m going to be talking about the possible ways we could manipulate paths in our EIGRP routing domain. R1 has two loopback interfaces. These will represent the networks we are trying to reach. note: The “no auto-summary” command isn’t necessary on IOS 15. I will be doing this in the background for all routers but won’t be showing you. Ok great let’s continue to R3. Now let’s confirm we have two routes in our EIGRP topology to those 10. networks before we proceed. Perfect, we can now continue with our manipulation. We have 5 options to manipulate which path we take to get to those networks..
First let’s see if option one is viable by checking if we have a feasible successor. Variance only works on routes that are feasible successors, they can’t be successors or routes that did not pass the feasibility condition. The feasibility condition: To become a feasible successor your route needs to have a reported distance that is less than or equal to my successors feasible distance. Notice how on R4, to get to those networks we prefer the link of R3 since it has a lower feasible distance for both routes. Since both prefixes only have one successor route, we should only see one route per network in our global routing table. Ok let’s manipulate the variance to make some of those flows go over both links. What this does is multiply the distance of our feasible successors by 2, and enables unequal load balancing per flow. Now we should see two successor routes for these two prefixes. 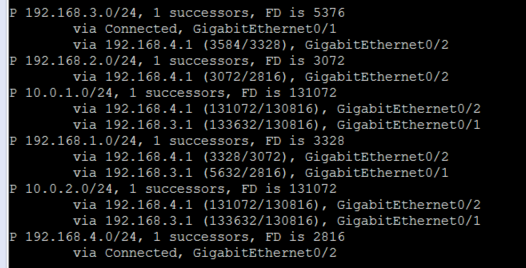 Perfect since we have two successors, both should show up in our global routing table. Awesome! You should be aware that the load-balancing mechanisms is provided by Cisco Express Forwarding (CEF) which uses a destination and source hash to allow for flow based load-balancing.Now let’s move to our second option. First I’ll undo these changes of variance so that we prefer only the link of R3 again. Option two is an offset-list. What an offset-list does is add distance to an outgoing or incoming route from a neighbor for prefixes we specify in ACLs or prefix lists. add a distance of 2600 so that we still have a feasible successor route and we can converge faster if we lose our redundancy. 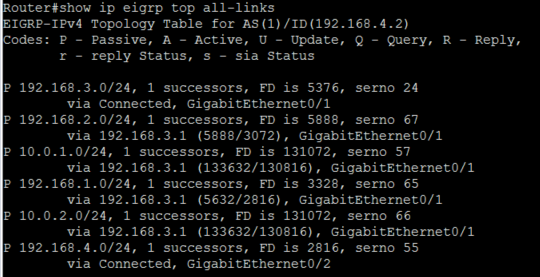 Now let’s check our eigrp topology to confirm our successor has changed for the network of 10.0.1.0/24 but also that we still have a feasible successor. Our successor route for 10.0.1.0/24 has changed, and we still have a feasible successor. 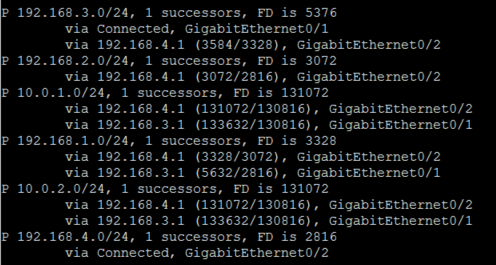 Now let’s check our global routing table, it should only have one route installed in it for each prefix. Great! Remember we only changed the distance for the 10.0.1.0/24 network that is why it goes over a different link. Now I’m going to remove the offset-list so we can go back to what we had at the beginning. Now we’ll play with the delay, I don’t recommend playing with bandwidth. If we change the delay we need to change it on both sides of the link. Now let’s check our eigrp topology table. Now the router prefers the link between R2 and R4 for both prefixes. Plus we still have our feasible successor so we don’t risk a slow convergence if we lose redundancy. Now I will undo the delay changes so we go back to the beginning, this time I will summarize a route so that the more specific route is preferred regardless of metric/distance. Let’s summarize the 10 network so that the link between R2 and R4 is preferred again. I need to summarize from R3 since I want R2 to be preferred. Ok, now let’s check R4’s routing table. Now I will revert these so we can try our last option, filtering routes. 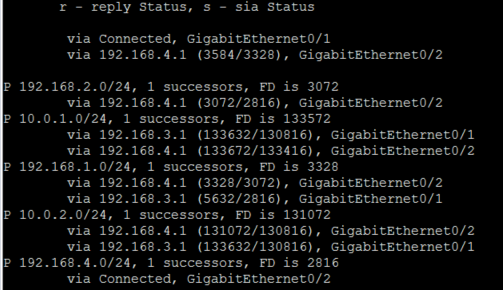 I will filter 10.0.0.0/22 from the EIGRP updates of R3. Let’s check R4 by using “show ip eigrp topology all-links” which will show all the routes even if they are not feasible successors. OOPS: Above you’ll notice I made a mistake, i forgot to add a second sequence to my prefix list, so really I’m denying the 10.0.0.0/22 network, AND everything else. No matter, you still get the jist, I’m filtering routes to my neighbor! That was fun.